Well, applesauce kind of.... I had some of Giada's Parm Porkchops in the freezer and wanted to use them up so I pulled them out a day or two ago... but then, what else should I make. Well, I'm a fan of bread with porkchops so I thought I'd just make some of the frozen rolls in the freezer. BUT, what else. 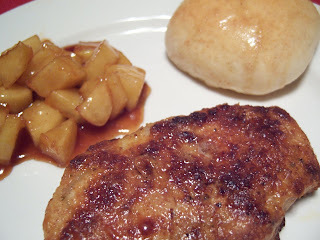 Porkchops and applesauce!! I've never made apple sauce before and I'm intimidated to do so (not sure why) but I didn't want jarred apple sauce.... what to do?! 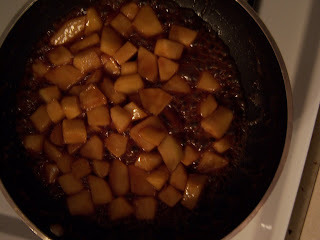 Then, my brilliant idea... fried or baked apples! I love fried apples. I have no idea if this is the common way to make them but regardless, they were fantastic. And, to top it off... I made cinnamon butter (similar to how I made the honey butter in the Giada's Pork Chops post!) to coat the rolls with during baking. Yum-o! * This would be GREAT over vanilla ice cream!